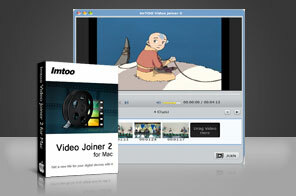 ImTOO Video Joiner for Mac is an extremely compatible device that supports all major video inputs and outputs including AVI, MPEG, WMV, MP4, FLV, MKV, H.264/MPEG-4 AVC (*.mp4), MPEG2 HD Video (*.mpg; *.mpeg), Quick Time HD Video (*.mov) and etc. Supports an exclusive built-in player to make your video joins and merges a breeze. Play with transitional effects to add a personal touch to your videos. Renders on highly-advanced research and will merge your videos within seconds. Also comes with an easy-to-use interface that makes video joining on Mac so powerful and yet so simple. Introducing ImTOO Video Joiner for Mac, a feature-packed programme that will allow you to join and merge videos at will, with extreme speed and ease. Featuring a wide host of supported formats, including AVI, MPEG, MP4, WMV, 3GP, H.264, MOV, ASF, SWF, DAT, and video editing for personalization, ImTOO Video Joiner for Mac is all you need for your video joining and merging needs. Select from a wide host of video formats including AVI, MPEG, MP4, WMV, 3GP, H.264, MOV, ASF, SWF, DAT to convert them into single or multiple videos. As an MP4 joiner/AVI joiner for Mac (any many more), directly integrate and put videos together from all types of different sources. Completely edit and add your own touch to your videos with a wide range of options and parameters to choose from. Transitional effects will make your videos the way you want them, and personal parameter settings can make your video perfect to suit any device. Add and merge as many files as you wish, the subliminally easy to use interface making it easy for you to rearrange the files that you want. Fast merging and processing speed makes video editing and joining fun and productive. With an in-built player, you can tweak and merge your videos to perfection. Supports English, French, Spanish, Italian, German, Japanese, and Chinese Simplified and Traditional versions. Professional video editing software helps you clip, cut, split, join, edit, and convert almost all SD and HD videos on Mac. Transfer music, video, photo between iPhone and computer, backup iPhone content to iTunes. Backup and copy DVD to DVD on Mac OS with excellent quality. Convert videos such as AVI, DivX, MPEG, MP4 to DVD disc, ISO image, and DVD folder on Mac OS.